Hong-Bin (Lee Dong-Wook) is an arrogant man with an anger problem. He runs a game company. The employees are all afraid of him. He holds a grudge against his father especially. His father broke up his relationship with Tae-Hee (Han Eun-Jung) and he still can't get over her. Recently, he seems angry all the time and his sense of smell has gotten more sensitive. His secretary (Han Jung-Soo) hasn't told him that when he gets angry, blades come out of his body. He is the only person that knows about that. One day, Hong-Bin goes to the hospital to see his employees who were beaten by him. There, he notices the scent of Tae-Hee. The woman who has her scent is Se-Dong (Shin Se-Kyung). Takes over the KBS2 Wed. & Thu. 21:55 time slot previously occupied by "Gunman in Joseon" and followed by "King's Face" November, 2014. First script reading took place during the third weekend in August, 2014 at KBS Annex Broadcasting Station in Yeouido, South Korea. Rety Mar 01 2019 8:38 pm Watching this many questions in my mind . The writer should tell more the unexplained story. The actor really did good job. Led Feb 10 2019 6:40 am This drama has a lot of flaws with its plot and script. Too many things were unexplained and the director/writer left the audience to assume everything that's supposed to be the key point of the story. They diverted so much from the main plot that the title of this drama wasn't justified. It was frustrating last 2014 that's why I didn't finish watching it. However, I finally did recently and just enjoyed it for what it is. Lee Dong Wook and Shin Se Kyung's acting were consistent and I loved their chemistry. The supporting characters were also good and nice. There were a lot of funny and sweet moments, as well as sad ones. I specifically like every moment where LDW asks for hugs. Secretary Ko is also seriously amazing! saadah Mar 08 2018 1:06 am soo......handsome. Lololol May 15 2017 10:09 am What is the name if Secretary Ko's girlfriend in real life? eNoppAa Feb 27 2017 1:02 pm I finally found the game ! If you want to try it, search : "LINE Get Rich". Sam Feb 20 2017 12:03 am @Khuristine Totally agree with u ... It's my cup of tea. Laughing at this like there's no tomorrow. Khuristine Feb 19 2017 8:57 pm I wonder why many didn't watch this and so as the ratings is the proof. I quite like the plot, totally got mixed emotions upon watching this. Laugh then cry, love then hate, resented the villain but learn to forgive their ways. Maybe it's the blade that caused the failure of ratings. But only if u don't focus on that flaw, u guys will surely like it. Uri Wookie oppa did an amazing job in here. He surely is great in whatever role he portrays. His eyes says it all. As for the female lead, she has so many bashers long before she accepted this role. I think it's because of the drama "When a Man Falls" where she also played the female lead. But everyone deserves a second chance right? Try watching this one and you will love her character in this. She didn't cry that much in every sad scene yet her eyes ~ you can see the pain in her eyes. I mean crying with tears is not necessary all the time to convey someone's emotion. This is what exactly "Eyes are the windows to the soul" is. So please to those who haven't watch this yet, just give it shot. The secretary is sooo funny and Chang is sooo cute too. I so love those "ANAJWO, PPALLI" (HUG ME, QUICKLY) scene. Cuteness overload of Dong Wook oppa. Hwaiting. bbh Dec 15 2016 7:22 pm funny drama, quite cute and all. the blades were very fake but nonetheless, lee dongwook is amazing. Star Wars Fan Nov 25 2016 3:48 am This drama was originally scheduled to be 20 episodes, but the ratings were not that good, and it appears the producers, etc. decided to end it at 18 episodes, so at the end of the drama, some things were left untold. RE: Butler Yoon, etc. The producers should have finished the last 2 episodes to finish it up correctly. Kira Apr 13 2016 2:53 pm Well, actually the story plot was good, the cast was well-chosen, main actress and actor had chemistry as well. I just watched it because of Lee Dong Wook...his acting was especially cool in that drama and different from other dramas where he played as well. And I liked the couple Dong Wook and Se-Kyung. They really should have left out the "blade coming out of his body combined with him having superman power" of the story. Just because he has got a Hulk action figure in his room doesn´t mean he is Hulk right? Didn´t fit at all and ruined the drama a bit. I always imagined that he was dreaming at all the scenes when these blades come out of his body when he gets angry why I still was able to enjoy the story as I liked the couple Se-Kyung and Dong Wook a lot. The ending could have been better but it´s still okay. Well wouldn´t say it´s worth seeing it but still okay to kill some time. bimil Jul 12 2015 8:41 am boring. Aj Jun 08 2015 8:34 am This is a good series: sweet, funny, magical, and touching. Both the leads shine, backed by a strong supporting cast, direction, and writing. However, though okay, the ending could have been much better focused and stronger. Such a good concept deserved better. But otherwise, I enjoyed this one very much. beterdk May 19 2015 2:14 am awesome drama .. love the actors and their acting especially Lee Dong-Wook. he is amazing! nics018frver Mar 03 2015 8:04 am Love this movie a lot!! sa Feb 17 2015 11:44 pm Love LDW but seriously talking i m kinda sick of SSK role... her roles r no diff in each drama with the stare n the innocent face she put up eps her lips. elllzz Jan 25 2015 6:15 am Actually...this drama is really interesting at first...but ..when u keep watching it..the story just really long and become bored...i finished this drama juz bcoz of lee dong wook ..huhu..
farah Dec 31 2014 6:28 pm I stopped watch it at last two episode because its little boring and I continue it a week after. shin se kyung need learn acting more. and tae hee, she get hurt and almost get killed in the past when pregnant. and when the dead is in front of her, she is broken heart. from the story, she is must be the first female lead. too poor. the sad part of se dong and Hong bin not really touched. honestly, I will change the channel if there is another drama at the same time. Rocelyn Dec 23 2014 8:04 pm The drama is pretty good. I love the comedy with a little touch of twist... i never knew tae hee still alive... Se Dong and Tae hee so pretty and lovable .. I love their kind and sweet character .. Hong Bin makes me smile, cry and fall in love in this drama... Chang is very cute and adorable.. Kudos to Mr. Lee Dong Wook and cast. Also to director and writer!!! Jaemin Dec 18 2014 12:32 pm This drama disappoints me in an emotional way. Lee Dong Wook is one of my favorite male actors and he did not choose the right drama to demonstrate his acting ability. There are two reasons why this show ends up on the bottom of my list: the writers and Shin Se Kyung. I do not enjoy Shin Se Kyung's acting at all. She ends up destroying any piece of emotion that could be held in a romantic scenario. Kay Dec 08 2014 4:24 pm This drama is really good. I really enjoy watching it. It's touchy, funny, sweet, but a bit bitter. And Chang is really adorable!! The storyline and acting are great also. may Dec 05 2014 6:26 am E I know what you feel , KTH was portrayed as week person who though knew about HB blades , she never tried to fix this thing as SSD did , she was always afraid to confront the father, she run away leaving HB behind , she even sent her child away but at the same time couldn't able to act martyr character to the end , till the end she didn't want to fight for her rights and seeking justice , same as her father who once told HB to forgave his father and forget about the past and KTH even forgave HB's father who lost all his money that he wasted his life gaining , and regarding buttler yoon it was implied that she was the one who sent her to the hospital back then and she lost the house she treasured and the man she is obsessed with . E. Dec 03 2014 7:58 am Seriously the writers of this Horrible drama should be ashamed of themselves! I wonder if they were doing Crack while they were writing it? Deda Sab Dec 01 2014 2:50 am I only watched this drama for LDW , I love him, and also the title and the story sounded interesting however, I am disappointed. I just finished watching it yesterday and the story lacks a lot and the reason was not deducting 2 episodes at all. the story is filled with unnecessary scenes to the extant that some episodes did not add anything to the main plot at all. the story had many potentials with the powers that LDW has, yet the writer decided to throw all of the important things that can happen and concentrate, rather poorly, on the relation ship between the two main leads and Chang's mother. I am not saying that it was a complete failure but it could be way better if it was designed from the beginning to be 16 episodes, so there would be a concentration on the main plot instead of leaving loose ends while filling the drama with unnecessary scenes. Rene Simpson Nov 24 2014 1:59 pm This is just the strangest sweetest k-drama, More people should see it. Well written, acted and directed. Not a whole lot of unneeded makjong. Great!!! ash379 Nov 20 2014 7:10 pm I love this drama. Lee Dong Wook totally awesome in this drama. I practically cry and laugh watching this drama. I still choose this drama over my lovable girl. For me this drama story plot is more interesting and enjoyable to watch compare to MLG. I'm gonna miss Lee Dong Wook! Hopefully he come back with new drama in early 2015!! Lee Dong Wook oppa, fighting!! Dieu My Nov 19 2014 11:19 pm Many people do not like her character when played by Seo Mi Do, and also a lot of people like her to play the character Son Se Dong. That shows she is the perfect role. Well done! Shin Se Kyung is a great actress! why do you not understand ? Remember the characters and actress are different. When you watch a new drama, you have to make yourself empty to receive. To me, I like her character Son Se Dong. Because this character suits her. Lee Dong Wook and Shin Se Kyung acted excellent, they convey the inner character very well: D Their eyes are acting so great., soul of eyes! Love this. Loo Nov 19 2014 3:31 pm Can't pass episode 9 because of SSH. Her acting is terrible. It would be another big hit for LDW if the producer use some other lead females. Metty Nov 19 2014 12:27 am To me, what I remember the most from this drama is the superb take of the scenes' angle (if you know photography, you'll understand what I mean). It's a work of art! The acting was great too. Many scenes only depicted the actor/actress acting with their body language (no lines required) and they were performed very well. This is a Korean drama made with Hollywood/international taste. Wonderful! albalicious Nov 18 2014 9:20 pm Feel good drama. all's well that ends well. Its good to see Lee Dong Wook having a yearly drama series with KBS. Hope it becomes a habit, they must really like his working attitude. LDW is not afraid to try on new roles, good for him! LDW and SSH were perfect for the roles. Hope KBS gives him another interesting drama that will challenge him and hopefully will have high ratings. Good Luck LDW! boo Nov 18 2014 12:18 am Finally.. they fly to the Moooooon..,,,,,,,,,,,,,,, !! Sakura Nov 17 2014 2:08 pm The drama is nice Specially son se dong it feel she like "candy candy" old cartoon girl character full strong and warm kind heart and the story is nice and interesting to watch because all characters in this drama are have their own interesting character. rose Nov 17 2014 2:03 pm In love with this drama , hope to see Lee Dong Wook soon in new drama. ghie Nov 16 2014 7:46 pm now i understand why its only 18 eps when supposedly its 20episodes.. this was a good korean show and fun to watch.though many things were unanswered due to cutting of 2 episodes,i hope there will be another season for this. ANNI Nov 16 2014 7:41 pm Congrats to all for producing this unique drama. a childish inside but as an adult I enjoy watching. likes HB & SSD on off r/ship so funny..countryside view is breathtaking..
Rese Nov 15 2014 11:12 pm Please have a second season! I love this show! and yes... this drama is beautiful and yet there are so many unanswered questions... when i was watching the last episode, i was silently praying that they would make a 2nd season for this drama. Because I swear, there are so many things that could still happen. They could write an entire 20 more episodes as a continuation. These are some of my hanging question... - Why Se dong keeps on passing out? (so it's just normal?) - What happened to the blades? so it's gone now since Hong Bin no longer feel hatred? or he got the full control of his power? - What happened to the guy who captured/kidnapped Tae Hee? Until the very end, Hong Bin did not found out that the guy was the real culprit together with the head house maid. -And the head house maid, there's something really really mysterious about her that i just could not put a finger on. andreea Nov 14 2014 11:52 am Definitely deserves higher rating. It was so beautiful. I loved watching this show, but why cut 2 episodes?? this drama was ended too soon . hebz Nov 13 2014 8:06 pm I don't understand why the low ratings.. I loved watching this drama, waited for it every week. Effa Nov 13 2014 5:40 pm Btw im from Malaysia and already watch the last episode at KBSW yesterday. Effa Nov 13 2014 5:28 pm Is it really the last episode yesterday?? i thought it would be a very happy ending drama, but then i have many thoughts of whats happening when Hongbin saved Taehui and Sedong fainted. Does it really ended that way without any justification? druidsdream Nov 12 2014 10:43 pm Meant to say thank god they didn't add amnesia to the plot! druidsdream Nov 12 2014 10:41 pm Why cut by 2 episodes??? I loved the show except how the writers always have to resurrect the dead. Enuff was happening without that. Thank god they didn't have the pot! All in all I loved the show. Lee Sruti Nov 12 2014 3:29 pm This is a really wonderfully organized drama. Amazing actors. Hong Bin's expressions and mannerisms really bring life to the character. This has certainly captured the attention of the Trinidadian viewers. kitty Nov 10 2014 11:07 pm yes, I think so, Nills. Shin Se Kyung is beautiful, so young and talented. "the eyes are the soul", she performed very well. Best actress 2013 MBC deserve her. Nills Nov 09 2014 5:30 pm actually for those who are commeenting about Shin Se Kyung a.k.a. Se dong,,,doesnt reallly fully understand what is really acting is...actinng is not only with a facial expressions, she been crtisezd for her bad acting..but if you focused on her "eyes" you can fully undestand what I mean,there are actors and actress who are brilliant in eyes expressions way of acting,if you know how to read there eye expression..they dont need to over use words or facial emotions. eyes is one of the most important way of communication...and Shin Se Kyung is great with that expressions.I have seen most of her drama..I got curious when I read about her critizism from the viewers..just my obsevation. Sunny Nov 06 2014 1:03 am Who knows why 16th episode hasn't been released this week? kebaek Nov 05 2014 8:47 pm Why is ep 16 not out today? Dong Wook oppa, i know you are tired with your back to back drama but it seems that my week won't be the same with out seeing you a tleast twice a week in the small screen. Hope you get another good drama soon. Bee Nov 02 2014 1:02 pm I'm so much in love with this drama, waiting for each new epi, counting minutes, when it will finally air. I agree with lots of you, that drama is much more, then blades coming from his back. It has one of the most epic loveline I ever seen in dramas, even movies. Hong Bin and Se Dond match so greatly and the acting of both actors is awesome. I also like sence with Hong Bin's secretary and his son. With Mr.Go they're funnt, and with son they're so touching. Of course, LDW is the best in this drama. He's gorgeous. I believe in every word, look, tear. I wish him a new project which will be even better than this one! Jezji Nov 02 2014 11:29 am Why it has only 20 episodes? I want more :( Will it have a season 2 or it will end in episode 20? ._. M Oct 31 2014 2:37 pm Really really really love this drama! Se dongs' acting is really good and can put me into tears... Hong Bin and Se Dong, for me are really good actors and they do have chemistry. The plot and story are not predictable. The soundtracks used are also great... it puts up the right atmosphere perfectly in every scenario. Kristine Oct 31 2014 12:54 am Can someone tell me the title of the instrumental song being played in the last part of episode 14? It’s too hard to look for it. Tried google, youtube, etc. Thanks! thanhnguyen Oct 29 2014 8:10 pm @MJang: the story is only begin .....you must have to watch the next and the next... you will see..... :D come on,,,,Don't miss it! Good luck! this drama has humanism... a childrens story for adults! I like it so much! Love this drama :) Oppa aja aja fighting ! MJang Oct 29 2014 8:13 am I can't continue to watch this drama aft ep1 even I love LDW.. This drama is so wired.. Am i the only one think LDW & SSK don't have chemistry at all.. I hope LDW get another good drama, possible funny & cute role...all his roles are too serious.. I want him to act in cute & care free role though.. Just stating my point of view...:) LDW fighting!!! kitty Oct 29 2014 4:23 am smile...laughter...and cry.....!!! This drama is humorous, tragedy....it is interested in me! the actors and actress play the charaters very well. Hugs heal the hurts... I like that they do that in this drama. Like this drama... the next ep...! kay Oct 28 2014 11:45 pm The ratings here are indeed low. Perhaps one of the reasons may be as to what I have been making me unenthusiastic to watch too i.e. the childish title of the drama and weirdness of blades sticking out of a man. The Writer/Director may have wanted to have something like superman or spiderman but the promotion and introduction of this drama was unable to flow in that direction. Furthermore the very thought of Shin Se Kyung (nothing personal) as lead actress put me off too. Even Lee Dong Wook who is one of my favourite actors cannot persuade me to start watching this drama. Hopefully I will change my mind one day though. thanhnguyen Oct 28 2014 8:53 pm I have to say the chemistry between Le Dong Wook and Shin Se Kyung is palpable and brings life into Le Dong Wook. They are explosive on screen and just feed so well off each other on screen that I can't get enough. I love Son Se-Dong. She's cute, oblivious, driven, passionate, and of course loving and self-less. You'd have to be a moron not to love her and find her utterly cute. SSK just brings this character to life. The boys seemed to be more so her children than younger brother-like. And she just cares. You would never lose with SSD in your life and SSK must have that in her to convey her so well on screen. Working with LDW is great. Even without this show ending, want them already pegged for another drama together. Excellent! We love this drama. Thanh Nguyen Oct 28 2014 8:45 pm I love, love, love Son Se-Dong. She's cute, oblivious, driven, passionate, and of course loving and self-less. You'd have to be a moron not to love her and find her utterly cute. Shin Se Kyung just brings this character to life. You would never lose with Son Se Dong in your life and Shin Se Kyung must have that in her to convey her so well on screen. Working with Le Dong Wook is great. I have to say the chemistry between Le Dong Wook and Shin Se Kyung is palpable and brings life into Le Dong Wook. They are explosive on screen and just feed so well off each other on screen that I can't get enough. Even without this show ending, want them already pegged for another drama together. :D Excellent! Stacy Oct 27 2014 10:40 am I like this drama so much. For sure I will watch it one more time, or even twice. For me the romantic line is so perfectly done. I was sure that Lee Dong Wook will fit in any role. But I was so surprised how really perfect he is in this completely different role (if to compare with his others). I'm so freaking in love with Hon Bin's manners and his "Hug me". I'm really surprised by acting skills of Se Kyong. I didn't like her in "When a man loves", but here I like her so much. She's so sunny. And I love their chemistry with Dong Wook. Regarding this iron thing, I hope there will be some more explanation. But it doesn't ruin the whole story. Actors are perfect, so do drama and romance. I regret it has so low ratings. Probably people refused to watch it further after seeing this iron thing. Their problems. And I hope this ratings thing will not have impact on next projects of Lee Dong Wook. Kdrama fan Oct 26 2014 10:00 pm Overall, not a bad series at all. The title is discouraging, stupid, and does little establish the true intent of the story line. At first, I had no interest. Thought it would be a weird sword fighting flick but it's a romance and I love romance stories. The story line is great and focus on overcoming personal heartache with love I agree the story can do without the corny blades coming from Lee Dong-Wook's shoulder. It serves no purpose. They should have found another way to express his anger over losing his first love. Besides this, it's a good series and can't wait to see the next episode. Watch this drama! It's GOOD Oct 25 2014 3:05 am I love Lee Dong-wook, but you guys know what would be WAY BETTER? If Han Jung-soo was the Blade Man!! omg! He's so good in this drama! Give HAN JUNG-SOO A LEAD ROLE ALREADY!! Watch this drama! It's GOOD! Oct 25 2014 3:02 am This drama is really good and so much warmth. Shin Se-kyung is not too bad in here, either, unlike When A Man Loves, haha. I think it has bad ratings because of the name of the drama and the vague description. There's more to this drama than it's name. WATCH IT WATCH IT WATCH IT! star Oct 23 2014 1:17 pm not sure with other viewers but i really like this drama so much. yes indeed, the blade thing is kinda weird but the story does not end there. It's just an ingredient to make it more interesting... what i like the most about this drama is, there's a certain warmth in every scene. funny, sad, thrill... on episode 12 now and i really like se dong and hong bin moment. Msknoitall Oct 22 2014 2:22 pm The child actor is just adorable! I am only on ep 7 but this drama premise is very strange. Blades emerging from the man when angered...really? On what planet does that make sense? Good actors but plot is just ridiculously stupid. Kwriters are clearly running out of good material. Saranghaeyo Lee Dong Wook oppa! Yanthie Oct 18 2014 10:45 am This drama got low rating because shin se kyung, she such a bad actress and terrible acting. I watch this for lee dong wook, his acting just awesome!!!!!! Rese Oct 16 2014 4:06 am My children and I LOVE this show! It had me laughing, crying, mad all at the same time. AMAZING! yunmia Oct 13 2014 4:23 pm It's just usual see LDW on before drama, but this drama made me think other think about LDW..HAHAAAA. he is really suit play here..
he funny, maybe because he also funny on roomate. hxanime Oct 11 2014 11:33 am I personally think that this drama is very cute and enjoyable to watch!!! I definitely recommend. Jaejii Oct 07 2014 2:51 pm I don't get why sedong confess to ceo that she likes him. Since when she likes him? I don't feel likeness on them yet. And then kissing, why?? Ichigo Oct 04 2014 9:50 am I definitely recommend this drama, lee dong wook is so dorky and amazing in here and shin se kyung fits into this character so well omg and u cant forget the lil adorable yoogeun XD oh and also the bromance between secretary ko and the CEO hahaha its hilarious ^^ cant wait till next ep!! shadowhite Oct 04 2014 6:59 am If your thinking of watching this drama I recommend you do!! It's absolutely worth it (so far) and I can't wait for episode 8 to come out!! I love the chemistry between Joo Hong-Bin and Son Se-Dong. I don't think that Son Se-Dong has parents and if she does her stories probably going to come soon :) all in all this drama is completely different from the usual dramas that come on and worth the watch!! farhin17 Oct 03 2014 4:19 am Hey guys, as many people are wondering where ep 8 is, well unfortunately it didn't air due to the '2014 Incheon Asian Games' so I think we have t wait one week for ep 8. K-Drama_Fan Oct 02 2014 11:50 pm What happened to ep. 8? I was dying to find out what happened after how ep. 7 ended. M Oct 02 2014 1:35 pm love love love ep. 7. Love everything about this drama. Lee Dong Wook is such an amazing actor! luvtaeminnie Oct 02 2014 10:53 am This drama is really good.......so far I've finished til ep 7 and i totally love it . Lee Dong Wook is a really handsome and good actor and Shin Se Kyung suits the character of cheerful, lively yet kind girl as well as its story line is good Highly Recommended !!!! rhuyi Sep 28 2014 8:32 am Hi why is the boss such a violent bully and nutcase. So horrible, I thought my boss was horrid but this is beyond imagination. Why doesnt his staff sue him? If me I will make sure he goes to jail for assault. Marchair Sep 25 2014 6:34 pm Love this show. It has a fresh unique voice-- funny and touching at the same time. I like Lee dong wook so much more than in his last show (hotel something). Also the lead gal is so great. I like how she is so kind, but not a pushover. I am watching lots of dramas and this one is right up at the top! Give it a try. Netizen USA Sep 25 2014 6:45 am I've been mainly familiar with Lee Dong-Wook through Roommate, I knew he had just finished working on Hotel King and had moved on to another project. I was curious about this but had forgotten about it until yesterday when it showed up in my HULU+ Feed. I knew about Shin Se-Kyung through Fashion King which I also just finished. Her character was awfully quiet on that show so I find it highly refreshing that in Blade Man she is spunky, lively and caring as can be. (Her character! I am talking about her acting, not the actress on a personal level). We're only 4 episodes in but so far I really like the show. I hope it ends well. As far the entertainment level goes I find it as entertaining (so far) as My Love From The Star. I hope it ends well. Time will tell! Shin Seung-Hwan was also in Fashion King with Shin Se-Kyung so I find it refreshing they're working together again! meena Sep 24 2014 10:58 am how come SSK smiles never reach her eyes? To me it looks like she is just grinning, not a genuine smile/laugh from the heart which reaches the eyes. M Sep 23 2014 8:06 am this drama is what i am looking forward to watch each week after "It's OK, that Love" and "Fated to Love you". I'd been a Lee Dong Wook fan ever since and it's so nice to see him acting flexibly from one drama to another. This drama is funny at some point and will also put you into tears... I love the female lead though she is too young, her acting is just right for her character. jaidee Sep 22 2014 7:19 pm Got to watch this phenomenal drama, Lee dong Wook has a resemblance of Johnny Depp, an American star also acted in Edward Scissorhands. The drama is exciting. The upcoming episodes are worth the wait in the internet. Love to follow the dramas of Lee Dong Wook for his a fine actor and with great acting skills. kbrylm Sep 22 2014 2:47 pm Watch it! that blade thing might be a bit over the top, but the drama is sooo refeshingly good! ... like a world mixed of kingdom hearts, the movie "I'm a cyborg but that's ok" and some japanese manga or anime. also cool characters and a good soundtrack. though the camera movement is quite good the colorist doesnt satisfy... but oh well, I cant have it all. shin se kyung's performing is way better than in 'when a man loves', lee dong wook is fine too. I like the supporting roles, especially the second male lead :D. anddd they picked out amazing shooting places *. * (who is the architect of this amazing house with that cool garden?!) so all in all (and to my suprise) its an enjoyable drama based on a very creative story. thumbs up! Breyedgrl Sep 22 2014 11:42 am I like the drama but for some reason I really do not like the female lead, Shin_Se-Kyung, she just has no expression. I felt the same when she was in When A Man Loves A Woman. Dian Sep 22 2014 1:07 am Lucu bangeeeetttt ! Pamela L Downing Sep 20 2014 6:57 pm I thought the show was really good. Left me wanting to see more of it. I want to know what happens to the little boy and the girl , does the girl and the dad fall in love. Does his father tries to take the boy from him. So you see I have some questions about this show so please finish it. E-mail me and let me know please!!!! You have a bless day. Thank you. mila Sep 20 2014 11:01 am I really really like this drama so I really hate that it has low ratings, it makes me wanna do something about it and I can't do anything!!! Dongwook oppa, fighting!! happy2behere Sep 17 2014 6:29 pm I LOVE Lee Dong Wook! I've only seen him in drama's so this is a different vibe for him..trying to get used to it..LOL (I can watch him regardless) 2nd episode was better as is the 3rd. I think the lead girl did a great job in this...she was nothing like the last character I saw her play and is showing a full range of emotions here...nice. Some people who have a solid opinion about an actor or actress come with pre-conceived ideas about them before a drama even starts. I think that is the case for our leading lady here. She had a tremendous amount of hate before this, so those people just keep on hating and carry it from drama to drama without a chance for redemption. Give the girl a chance...this role seems to suit her! dramammama Sep 16 2014 2:48 pm I like the comedy! I love, love, LOVE Dong Wook! It's hard to watch the Three Stooges-like domestic and office violence. I view them as cartoon characters and keep rolling. adi Sep 16 2014 9:16 am I only watched the first two episodes so far :D (my opinion might change later). The drama is pretty ok, quite funny. I don't understand how he gets the blades, make it rain and what he turns into, nor how he ends up cutting those trees so nicely but it's pretty interesting so far. I hope they don't ruin it with some inconsistencies regarding the fantasy side of the show. I don't know much about the actors but so far I like the main girl a lot (she cracked me up when she panicked and beat up the airport guy :)))) ). The male lead falls a little short ( a little bit because of some too over the top scenes the actor had to play and a little bit because of the way the actor decided to portray his character) but I hope to warm up to him completely in the next episodes. Still, the secretary is spot on. I just loved every scene with him. His every expression was priceless and extremely funny. I hope he keeps getting just as much screen time in the future. And the butler lady was great too. katlin Sep 15 2014 6:45 pm @Nanachu , the drama comment police..The one who will forbid us to write comments concerning the acting in a drama we watch..If you cannot distinguish the difference between hate comments and ones that show disappointment or opinion in how an actor/actress displays the part,or director even writer proceeds with the drama, then it is not the right place here to read the comments. The drama has a weak point IMO and for me that is the lead girl.How strange to be offended by such critic..
Wolfgirl Sep 14 2014 1:20 pm Well, I'm might be in the minority here. I really enjoyed watching the first two episodes. I'm not saying it was a masterpiece or whatever, but it was very different and a nice change. I really like Song Se Dong's character - specially the fact that she's not some crazy, clueless, poor girl which is normally the case with kdramas- Joo Hong Bin's character was a little over the top for me, specially in the first episode, but then I started to understand him better ... the fact that he doesn't know about his ability, the anger that he's holding inside, the loss that he has suffered, and the hope for tomorrow that he has ... I really like how the first 2 episodes unfolded, I hope the writers keep this up!! fighting !!! Tristie Sep 13 2014 10:39 am These actors are developing and are the future of Korean dramas. I think Lee Dong Wook is excellent in this part. 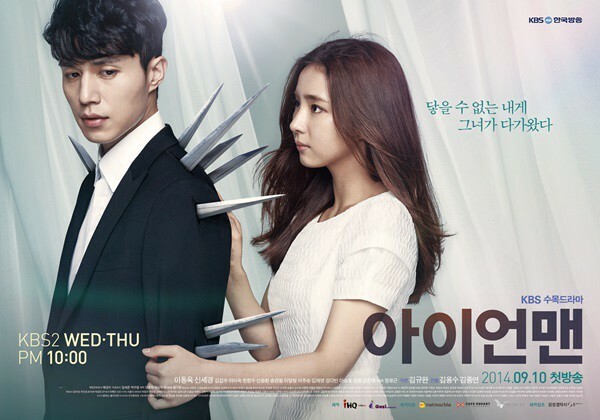 and Shin Se Kyung has the ability to be a sympathetic lead women to fix a broken man. The industry provides me (and you) with hours and hours and hours of enjoyable entertainment every year. I hope you appreciate that and look for the good in every program provided. I am very please with the translation from the manga story line. I intend to enjoy both actors (artists) in their parts. I really hope you all do too. And no, I don't work for the Korean drama industry. nanachu Sep 12 2014 7:42 pm from katlin below:...."""i am disappointed to see lead roles given to inferior actors or idols because of connections managers companies etc"""
I also dont like that too many IDOLS interfere or steal the RIGHT of actor who must try hard to be the best ACTOR...... just by one minute loss their chance because IDOLs company influence. katlin Sep 12 2014 2:12 pm I don't think it's her fault that she can't express emotions which is essential as an actress.I strongly believe that some beautiful girls due to plastic surgeries cannot have facial expressions intense and convincing.Tired to see huge round eyes opening to express fear surprise sadness etc...I support Kdrama so much and i am disappointed to see lead roles given to inferior actors or idols because of connections managers companies etc. Every year,really good dramas become less and i wish for it to change. leave shin se kyung alone Sep 12 2014 10:13 am you guys are really mean . Everything you say has a limit. So stop saying bad to her !!!!!!!! Catherine Sep 12 2014 6:06 am Just finished the 2 episodes and I liked it! Lee Dong Wook is absolutely amazing! How he fits in every character that he make is fantastic! Such a good actor! I'm very pleased with him being in this drama! Just for the Shin Se-Kyung I don't think that she is bad in her acting, but this is the first time I saw her acting! And so far I'm not disappointed! But it's only 2 episodes! I hope it continue suprising me positively! nicky411 Sep 12 2014 5:13 am Watched the first 2 episodes and was pleasantly surprised- which is good. Lee Dong Wook was excellent as always but is giving us a new dimensjon to his actjng. I am sure he wanted this challenge and that is why he agreed to another drama so soon after Hotel King. BUT the supporting cast is also very good, which i think allows me to gloss over her deficiencies. I actually think i may enjoy this drama. Thank you LDW for changing my mind. You are an actor in a totally different level. FIGHTING!! woofhart Sep 11 2014 5:14 pm Shin Se Kyung aint a bad actress. In fact, her character's got charm to it... but that's only my own opinion so don't flame me. I reserve my review on this series until later episodes... What I can say for now is that Lee Dong Wook is good. Well, he's always good in every role he's in. It shows that he's really giving it all that he's got. -the poor daughter/son who somehow gets job at corporate buisness. For some motive, I think the reason why you (some ppl) which usually DONT like Shin Se Kyung act are because you jealous for her..
nita Sep 11 2014 12:52 pm Very disappointed. Shin se kyung is such a disappointment. After all these bashings, one would have expected some improvement, but alas, no. gado Sep 11 2014 8:09 am Please stop with the super fn long pauses where they just stare at each other for 100 minutes! (what are they doing? Posing for pictures?) As for Shin Se-Kyung's acting...she's very pretty but she would be a better fit for movies where she's a robot or android! peach Sep 11 2014 8:01 am The drama poster shown in this page is quite ridiculous. K Drama Fan Sep 11 2014 3:18 am Have just the watched the first episode, very interesting. Lee Dong Wook is showing the diversity in his acting. He's a very good actor, very believable! The first episode is a mixture of humor and drama. Can't wait to see what the rest of the drama will be like. MarieAnn Sep 10 2014 8:38 pm Please tell me .... Is this showing already and where to watch this good drama. MarieAnne Sep 10 2014 8:35 pm When this drama will be available to watch. Ive been waiting. Thank you. chrissyllee Sep 10 2014 6:16 pm I hope they mean figuratively about the blades that come out. Radar Sep 10 2014 5:04 am Sounds like he needs physical and mental therapy unless the female lead can give him that too? shermila sher Sep 08 2014 7:18 am wahhh..daebak drama..
jaidee Sep 07 2014 6:26 pm looking forward and excited to watch this on line... love to see lee dong wook's new drama. i always love to see his handsome and cute face plus his great acting....goodluck!!! boom Sep 06 2014 5:12 pm Gonna be hard to appreciate Lee Dong Wook's work with her in the way -_- Half this drama is already r.u.i.n.e.d. hayzen Sep 02 2014 12:58 pm Finally Shin Se Kyung is back, I have been waiting for you. you have your geniune fans supporting you. Go ahead and melt Dong Wook and everyone heart, Fighting Shin Se Kyung. Maria Lopez-Martinez Sep 01 2014 3:58 pm So excited to see Lee Dong Wook! Loved him since I saw him on Scent of a Woman! I'm not familiar with the leading actress, but you all seem to agree that her acting skills are lacking. If that is so, what were the producers and director thinking? Rin Aug 31 2014 5:30 pm The description of the woman does not suit Shin Se Kyung in any sense at all. I hope, for once, she can actually act. Lee Da Hae should've had this part or someone that can act. julia Aug 25 2014 12:40 am Till what episodes have a iron man korean drama...???? Korean Movies Aug 24 2014 5:07 pm Aaah I love Shin Se-Kyung! Love this. Nila Bene Aug 23 2014 3:25 am Hopefuly her acting improve ,Shin Se-Kyung...fighting!! Nila Bene Aug 23 2014 2:50 am hoping she improve her acting skills..Shin Se kyung...fighting!! Kim Aug 21 2014 4:40 am I actually really like Shin Se Kyung. Maybe her acting is not that great, but when A Man Loves was great in my opinion, and although Fashion King Sucked, the male lead was cool, and I liked Shin Se Kyung. Hope she has improved for this Drama! Kinggofing Aug 20 2014 10:48 pm Oh come on, stop bashing on SSK, she's not that bad, lets all just wish that she polished her acting skill before they filmed this. dramADDICT Aug 20 2014 4:50 pm Looks like Lee Dong Wook may have to carry this drama unless the leading lady, Se Kyung, has improved a lot. Her body language, delivery of the lines and especially her lack of facial expressions that fit with the lines have been problematic in her past roles.. I really hope she and the drama does well. kittykat Aug 18 2014 9:42 pm Why? ?This Iron Man role sound similar to HK role, hopefully i am wrong. Not exactly excited about this drama. Will watch it because of Lee Dong Wook only !!! debrainmke Aug 18 2014 8:17 pm Oh, God! Not her again.....the rating have tanked even before the drama airs. She cannot act!!! No ifs, ands, or buts about it! Poor Lee Dong-Wook! smile Aug 13 2014 6:23 pm Hope this drama will be a good one since its Dong Wook oppa, but actually I do not like Shin Se Kyung's acting..
yoon Aug 10 2014 2:48 am Lee Dong Wook seems to already accept this role. It's a pity how this drama is only a month before it's first broadcast, three weeks before its press and yet the production is still on the searching cast phase. My respect goes to Lee DongWook who help by accepting this role before KBS2 canceled the drama. Ayoko Aug 08 2014 1:48 pm Come on - don't be like that! He Is actor so its his job to act in another dramas! Ally Aug 08 2014 7:04 am PLEASE, PLEASE Lee Dong Wook oppa don't accept this role!!!!!!!!!!!!!!!!!!!!!! !